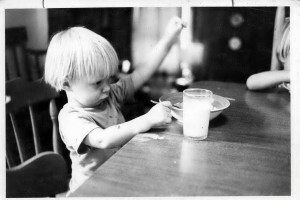 Michael, age 3, playing with his food. This is a hard time of year for me. Tomorrow is Mike Day, the anniversary of my son’s death. I think he chose April 1 to go; he was a proud jackass. He loved turning things upside-down and inside-out for a good laugh. His best friend, James, eulogized him as a jackass and everyone laughed and applauded. I don’t know why this doesn’t get any easier. I honestly thought that after seven ears I would miss him a little less, that the edges would have worn off the pain, but that’s not so. I think of him every day, sometimes every hour, and on days near the anniversary of his death, it’s more like every moment. I’m not talking about the friends and family who have stood by me and held me up, although I treasure them; I’m talking about the hundreds of thousands of others whose family members and friends have died the way Mike did. Before the Affordable Care Act, the death toll was 45,000 a year, and each one was loved by somebody. Each person was adored by friends and family. The death toll is lower now — about 17,000 a year in states that have refused to expand Medicaid. How about this? It’s time to stop this immoral and inhuman killing of people just because they can’t help enrich insurance companies and Big Pharma. Or, this for all the “Christians” who think we don;t need to ensure access to care for everyone: Who would Jesus turn away? And for those of you who are “pro-life,” but think that doesn’t include access to health care: You are most decidedly NOT pro-life, even though you have tried to make the definition only about abortion. I chose not to have an abortion when I was advised to do so, and you “pro-lifers” did nothing to help him get the care he needed after he was born. Maybe if I was alone, if my son’s case was an aberration, it would be easier. But my friend, Lila suffers every day because she can’t get insurance. The pain she endures makes it impossible for her to work full-time, and without that income she is eligible for neither premium subsidies nor Medicaid. My friend, Crystal, is just 30 years old and the mother of two. She has cervical cancer and can’t get treatment because even though she works, she can’t get insurance or Medicaid. She’ll likely die the way my son did, and she will leave behind two orphaned children. If their lives don’t matter to you, you are not pro-life. If their lives do matter, you need to do something about it. Our state legislators say the people don’t want to care for the poor because they’re lazy bums. What they don’t tell you is that 88 percent of people living in poverty have low-wage jobs. And in this so-called economic recovery, most of the jobs being created are low-wage. Fully one-third of people in poverty have two full-time workers in the home and still live below the poverty level. We need to call and visit our legislators and tell them they’re going home in 2016 if we don;t have expanded Medicaid by then. And then you need to work hard for the candidate who will expand access to health care. We did it here in Buncombe County. We sent home Tim Moffitt and Nathan Ramsey and replaced them with people who will vote to close the coverage gap, expand Medicaid, stop the senseless and immoral carnage — however you want to phrase it. My precious son has been gone seven years. I had hoped we would have made more progress by now.